LONDON • Pep Guardiola has cast doubt over Sergio Aguero playing for Manchester City again this season as the Premier League leaders try to get back on track after three consecutive defeats. Aguero suffered a knee problem that kept him out for a month before the Argentina striker managed two second-half substitute appearances in City's last two defeats - by Manchester United in the league and Liverpool in the Champions League. 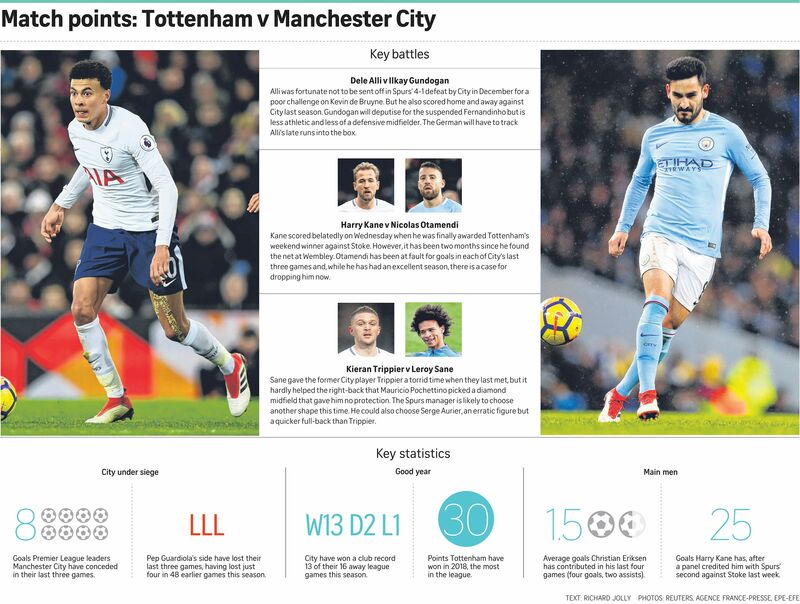 City travel to Wembley to face Tottenham Hotspur today but Guardiola revealed Aguero will not feature against Mauricio Pochettino's side, with doubts over when he will return. "I don't know," said the City manager. "We cannot forget he was one month injured. He made a huge effort because after the action from Ashley Young against United (a second-half tackle) with the problem with his knee, he could not train. "He played the last 20 minutes (against Liverpool) and after the game said: 'I cannot run, I have a lot of pain, I cannot run'. I don't know about Swansea (next week) if he'll be ready but hopefully for the last games if we need him and especially for the World Cup." Guardiola claimed he has only 14 outfield players available, though he only named a few of those out. "We have 14 players plus the kids. We have problems - John Stones is not ready, Fernandinho is suspended, Benjamin Mendy is out ," the Spaniard told a press conference yesterday. City boast a 13-point lead over nearest rivals Manchester United. Victory over Tottenham and a United loss to bottom club West Bromwich Albion tomorrow would see City crowned Premier League champions. But Guardiola knows fourth-placed Tottenham, unbeaten in the league since losing at City in mid-December, will be a stern test for his side. "The league is played over a lot of games and we need five points from six games," he said. "The first option to take points is tomorrow, one of the toughest games we have. "Tottenham are a fantastic team... They have been playing great with a lot of success in the last two, three seasons and are in the semi-final of the FA Cup. It is going to be a difficult game for us." Tottenham manager Mauricio Pochettino believes his side - who trail City by 17 points - must maintain their form in the second half of the season for the whole campaign if they want to be Premier League champions next year. He played down the significance of beating City as a springboard to winning the title next season. "It is not about one result that we are going to show that we are ready or not ready," he said. "We need to be consistent during the whole season and be the best team like Manchester City is doing today. We need to show ourselves that we can compete. "In football in 90 minutes you can win or lose, but we need to be more consistent through the whole season in result and performance because you need to be consistent if you are going to win."